Background: gait variability may be an important predictor of falls risk, but its characteristics are poorly understood. 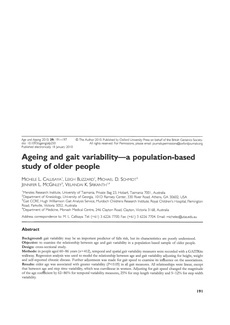 Objective: to examine the relationship between age and gait variability in a population-based sample of older people. Design: cross-sectional study. Methods: in people aged 60� years (n=412), temporal and spatial gait variability measures were recorded with a GAITRite walkway. Regression analysis was used to model the relationship between age and gait variability adjusting for height, weight and self-reported chronic disease. Further adjustment was made for gait speed to examine its influence on the associations. Results: older age was associated with greater variability (P<0.05) in all gait measures. All relationships were linear, except that between age and step time variability, which was curvilinear in women. Adjusting for gait speed changed the magnitude of the age coefficient by 62�% for temporal variability measures, 25% for step length variability and 5�% for step width variability. Conclusion: age is linearly associated with greater intra-individual gait variability for most gait measures, except for step time variability in women. Gait speed may mediate the association between age and temporal variability measures. Further study is needed to understand the factors responsible for the greater gait variability with ageing.